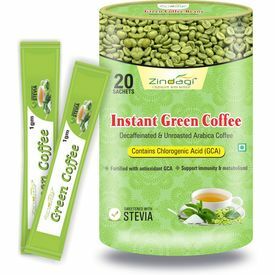 Zindagi Instant Green Coffee powder is loaded with antioxidants and pharmacologically active compounds. It is rich in antioxidants that are helpful in keeping our body healthy. This green coffee powder also contains a substance called Chlorogenic, which is believed to be responsible for the weight loss effects. Chlorogenic has also been shown to drastically improve cholesterol levels. It can reduce body weight by reducing the fat absorbed from your diet. Green coffee powder also positively affects blood vessels. This is highly beneficial for people who are at risk of diabetes or are diabetic already.